You gotta look good to play good. Eh, well, not really. But it certainly doesn’t hurt to look the part of the role you are trying to play. If that role happens to be an all-weather, classically fashionable rider of motorcycle, the Olympia Troy Jacket can get you well on your way. 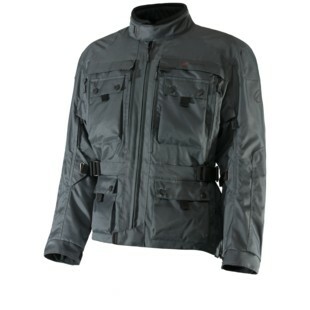 In making use of Olympia’s Three Layer system that consists of 1) a rugged 600D EVO Thread outer shell, 2) an AquaRes waterproof liner, and 3) a removable thermal full-sleeve liner, the Troy Jacket is well-equipped for just about any riding scenario. At the same time, to extend the functionality into the warmer months, the jacket comes with Olympia’s Mega Vent Panel System at the chest, back, and arms that allows for large panels of mesh to be exposed in order to flow a ton of air throughout. Additional features of the Olympia Troy Jacket (in addition to being just a fly looking jacket!) include YKK zippers, removable CE-approved armor at the elbows, shoulders, and back, as well as an 8” connection zipper that allows it to seamlessly connect to Olympia pants. In the end, some things never go out of style. Blue jeans. T-shirts. Classic motorcycle jackets. All of these will be well-worn in any era. While the Tory motorcycle jacket can’t really help much with the first two, it has been well-designed to more than answer the call for the latter.